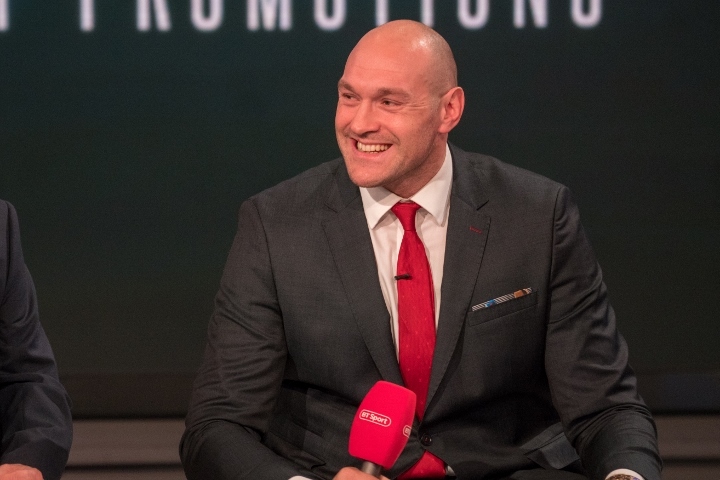 A grand arrival is officially in store for Tyson Fury’s Las Vegas debut. The unbeaten heavyweight from England will play Sin City for the first time in his career, with his June 15 clash with Germany’s Tom Schwarz officially landing at the MGM Grand Garden Arena. The destination for the ESPN+ card was confirmed through MGM Grand Hotel’s corporate office on Monday. Lead promoter Top Rank originally had a hold on UNLV’s Thomas & Mack Center for the event as a placeholder to lock in the date and with MGM Grand always in play. With venue confirmation comes the first major heavyweight bout to headline at the venue since Jan. ’15, when Deontay Wilder soundly outpointed Bermane Stiverne over 12 rounds to begin his still current title reign. Wilder’s most recent title defense, of course, came in his thrilling 12-round draw versus Fury (27-0-1, 19KOs) last December in Los Angeles. Talks for a sequel began mere days after their Showtime Pay-Per-View headliner and appeared far advanced, only for Fury and promoter Frank Warren to catch many in the industry off guard with their signing with Top Rank and ESPN in mid-February. The move functionally killed any plans for an immediate rematch, although a peace offering coming in the form of a multi-fight deal presented to Wilder to join the ESPN family. The offer was rejected by Wilder (40-0-1, 39KOs), who will next make a mandatory title defense versus Dominic Breazeale on May 18 at Brooklyn’s Barclays Center, live on Showtime. Four weeks later will come just the third stateside fight for Fury and his first ever in the boxing capital of the world, which for the Brit has long remained a bucket list item. His dream destination comes in the form of a scheduled 12-round affair with Schwarz (24-0, 16KOs), an unbeaten fringe contender from Germany who makes his stateside debut. A notable win is currently lacking from the résumé of Schwarz—who turns 25 in May—but is ranked among the Top 10 in the current set of heavyweight rankings from the International Boxing Federation (IBF) and World Boxing Organization (WBO). Both titles are currently in the possession of Fury’s countryman, Anthony Joshua who makes his U.S. debut in a June 1 unified title defense versus Brooklyn’s Jarrell Miller. The lone other stateside appearance for Fury came in April ’13, when he climbed off the canvas to stop former cruiserweight champ Steve Cunningham in seven rounds. He would go on to win the World heavyweight championship, dethroning long-reigning king Wladimir Klitschko over 12 rounds in Nov. ’15. Not a single successful defense came of his reign (despite marketing efforts still reference his lineal title reign) as Fury entered a 31-month self-imposed ring hiatus to battle drug addiction and mental health issues. He enjoyed a triumphant return last June, winning a pair of rust-shaking bouts over the summer before his memorable clash with Wilder. The June 15 ESPN+ show will mark the first show at this venue for Top Rank since last June—a year almost to the day. That card also streamed live on ESPN+, headlined by Terence Crawford’s third division title win in a 9th round stoppage of Jeff Horn to become a welterweight titlist.